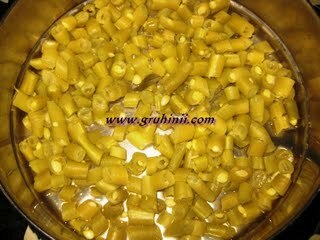 Take half cup of moong dal in a pan. 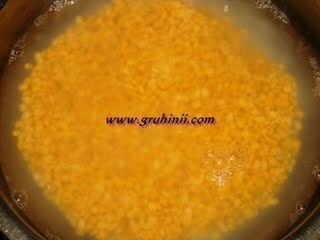 Fry in a medium flame (without oil) until the dal turns to golden color. Add 2 cups of water. Par boil the dal and keep it aside. You can see in the above pic. Pressure cook chopped beans in a cooker for 2 whistles and keep it aside. Heat 2 table spoons of oil in a pan. Add rai, jeera and urad dal to it. 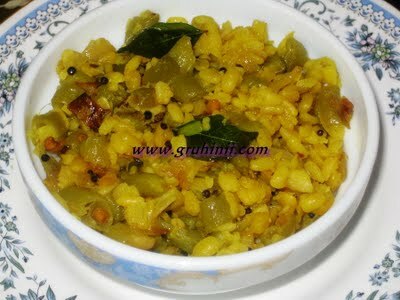 When the dal starts turning to golden color add red chillies, mashed garlic pods and curry leaves. Fry for few sec. 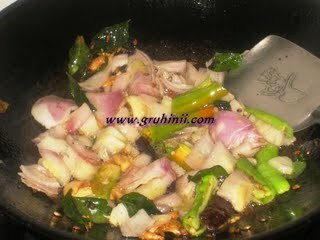 and add chopped onions and green chillies. Fry in a medium flame until the onions become translucent. Add haldi mix well. 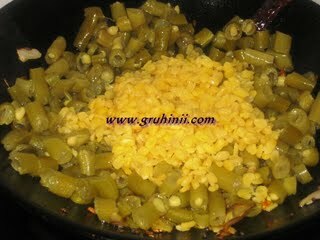 Now add boiled beans and moong dal. Add salt and mix well. Cook for few more min. and switch off the flame. 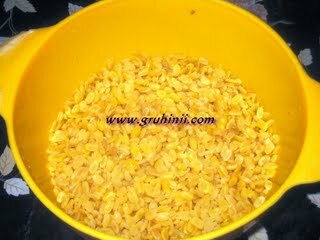 (you can also add fresh grated coconut too) Take the curry into a bowl and garnish with chopped coriander leaves.